Chunky Dunk: Chunky Dunk co-organizer Amithyst Fist cools off with friends at the Peninsula Park Pool. Baring skin at the pool can make even the most confident folks feel a little self-conscious. But for people of size, what should be a relaxing summer ritual is often a source of ridicule. Lucky for fat Portlanders and their friends, there’s Chunky Dunk. Organizers rent the Penninsula Park Pool in North Portland on summer Sundays and attendees offset the rental cost with their $5 sliding scale donation. Chunky Dunk was started a few years ago by Stacy Bias, creator of FatGirl Speaks, and is currently organized by NOLOSE board member Amithyst Fist and her friend Domi. Though the swims were designed as a safer space for people of size, all are welcome. Chunky Dunk even holds a trans-specific swim once a year, recognizing the body policing faced by transgender folks. 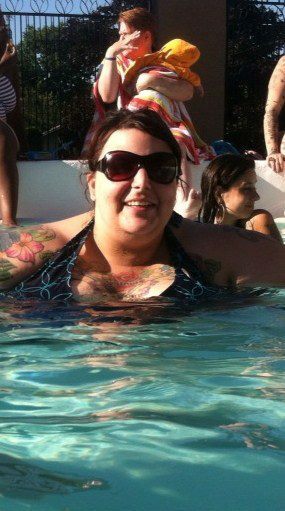 While Chunky Dunk typically gets rave reviews from attendees of all sizes, in a recent edition of the Portland Mercury “I, Anonymous” column, one woman shared her negative experience at an unnamed “fat acceptance” swimming event. She claimed that the other attendees made her feel unwelcome because she was too small. Fist says she is unaware of anything like that happening at Chunky Dunk. The final Chunky Dunk of the summer takes place Aug. 26, 5 p.m.-7 p.m., at the Peninsula Park Pool, 700 N. Rosa Parks Way. For more information, visit chunkydunk.org or find Chunky Dunk PDX on Facebook.